Did you think that Viking women and men were colorless and wore gray dresses and wool robes? A number of findings and saga texts are documenting the opposite: The Vikings loved colors. The Vikings used strong colors, on both shields, ships, sails and other equipment. Moreover, free men and women wore dyed clothes with patterns and ribbons where the colors were important for highlighting social status. Blue in particular, but also red, were popular. The amazing discoveries made in the Oseberg and Gokstad burial mounds also documents the use. When the Oseberg ship was excavated in 1904, the extremely good preservation conditions made the archaeologists able to see the colors clearly, but sadly, they quickly faded being exposed to light and air. The Oseberg burial chamber was decorated with colorful tapestries showing dramatic scenes and many of the beautiful wooden objects were painted. There were also found remains of paint on the shields on the Gokstad ship. King Canute the Mighty, along with his ally Hacon the Jarl, in the year 1028 went to attack against Norway with 1,400 ships. When Canute the Mighty had fitted out his army, he had a great crowd of men and very big ships. He himself had a Dragon which was so big that it counted sixty benches (120 rowers, Editor’s note), and on it were gold-decked heads. Hacon the Jarl had another Dragon on which there were forty benches, and on it too there were gilded heads. The strong colors and patterns had important symbolic value: To demonstrate power and wealth, and to deter the enemy. This King Canute achieved and the Norwegians joined him and forced King Olaf II Haraldsson to flee. See also: How Did This “to Allah” Ring End Up in a Viking Grave? So what roots,seeds etc did they extract the colours from? Elaine, thank you for commenting here on ThorNews. I am not an expert on Viking Age dyes, but there are well-known plants, roots end insects in Scandinavia that you can extract colors from. 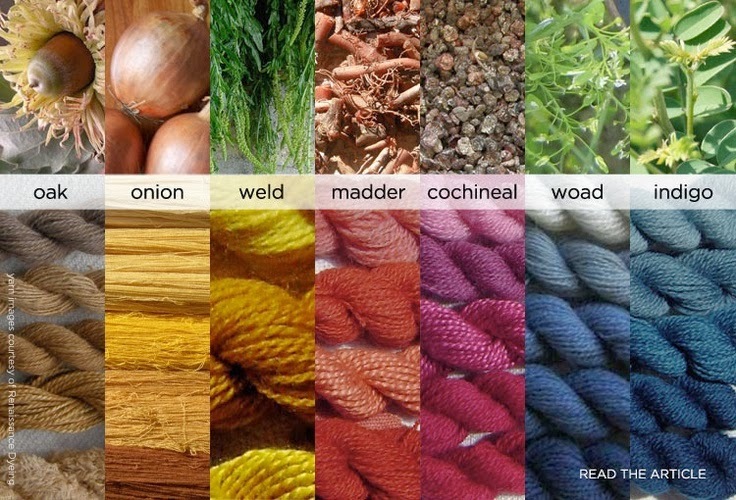 Love this article and the follow up with plants and how they made natural dyes. Not cochineal as it was not found in Europe. “The cochineal (/kɒtʃᵻˈniːl/ koch-i-NEEL or /ˈkɒtʃᵻniːl/ KOCH-i-neel; Dactylopius coccus) is a scale insect in the suborder Sternorrhyncha, from which the natural dye carmine is derived. A primarily sessile parasite native to tropical and subtropical South America as well as Mexico and Arizona, this insect lives on cacti in the genus Opuntia, feeding on plant moisture and nutrients. These insects are found on the pads of prickly pear cacti, then are brushed off and dried.”Wikipedia.